"Todd Lappin here, blogging in my official day-job capacity as the editor of Everywhere, a user-generated travel magazine based here in the city. I mention this because the next issue of Everywhere will include a feature story about travel to San Francisco, and we’d love to get more article and photo submissions from SF locals." No, no, I haven't forgotten about this here blog. But I've been on vacation, and I'm still catching up on all the stuffs on the interwebs. I was having a fine time in Puerto Vallarta with six friends. It was tropically hot and humid, but we were right on the beach, and even had our own rooftop dipping pool. And beer. And tequila. So it was all good. I'll tell you more about it over the next few days. Trying to decide which one is my best photo of 2007 (there's a discussion over here). I think maybe it's this one, although there are several others I like very much. What do you think? And what's your best 2007 shot? If you're wondering why I haven't posted anything for a week, it's because I was completely unplugged, away from my laptop and cell phone. Heck, I didn't even bring my iPod! I spent six days with four great friends in Cabo San Lucas, Mexico, at lovely tranquil hotel Los Milagros. 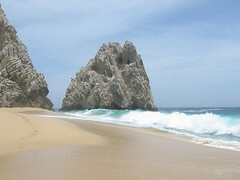 The rock depicted here is at Land's End, where the Pacific Ocean meets the Gulf of California aka Sea of Cortez, and where, if you steer straight south, you will not see land until you get to Antarctica. Silvia and I just booked a weekend trip to Vegas. "So, Elke, what was the highlight of your trip?" asks Barbara over Chinese barbecue lunch. - when the plane took off in San Jose, I followed along above 87, the Alma exit, Willow Street ... and sure enough, there was my house! First time I've seen it from the air. - getting off the plane at Austin Bergstrom Airport and being greeted by the Salt Lick and Amy's Ice Cream right out of the gate. - Breakfast/lunch at Las Manitas on Congress Avenue. They have a homey feeling, and the bestest corn tortillas - white and gritty and almost crunchy. - staying with Jeff and Barbara and Ellen. Barbara said I was the best guest ever. (For the record: they are the best hosts.) I think we're just a happy match: they give me a key and let me loose, no muss, no fuss. - Alex Steffen's ideas for "greening your geek". I wish this was posted ... great presentation! Meanwhile, check out WorldChanging, where he's the editor. - Thunderstorms! Glorious light and sound effects, and lots of rain. - Beautiful sunny spring weather. - going to the Ducati party at Hi/Lo and Betsy's Bar, and getting to see Jeff's friend Mark, and meeting his Ducati posse. (Mark is the VP at Mototek, Austin's Ducati dealership.) One of many reasons I like Jeff so much, and why I like Austin so much, is how friendly people are. Californians are not bad, but Austinites are great. I made several new friends on this trip, and I am already looking forward to see them again. - drinking margaritas with Todd and Carol and Craig, toasting to recent management changes that we are all very happy about. - a long lunch with my Apple pardner in crime and counterpart Bryant, who reigned over French as I presided over German. Now he's king of the world, expanding out in the outer boroughs of the universe. - Oreo's ice cream topped with strawberries at Amy's. - grocery-shopping at Whole Foods headquarters. It is HUUUUUUGE. And they have everything. And then some. - Finding a 5 CD Jacques Brel box set at Waterloo Records. - Riding to San Antonio with Jeff to drop off his daughter Ellen at his parents', listening to Tim Curry clearly enjoying his narration of A Series of Unfortunate Events, and driving back in the pouringest rain I have seen this year. - seeing a movie at the Alamo Drafthouse for the very first time, falling in love at first sight with their concept and execution of serving food and drink, and playing the funkiest clips in between movies. - shopping and hanging out at Tesoros, the store that has such great folk art. - leisurely strolling around the brand new mall, The Domain, at Braker Lane right of the Mopac, checking out the new Apple Store, where I had the most high-tech shopping experience ever. There are no registers. The sales people all carry credit readers, and you just walk up to someone with your merchandise in hand, and they ring you up. So I just HAD TO buy something. I perused the iPod cases, and picked out the pretty Japanese Kimono case. Verified that it would fit my 80GB iPod, and forked over my credit card. It didn't occur to me until afterwards that I didn't even have to sign anything. "Would you like your receipt emailed to you?" asked the sales lady. I nodded yes and gave her my email address, and when I got home, there it was ... no paper involved at all. How nifty is that? Yes, yes, I know, obvious title ... but so what? Sometimes you just have to go for it. Like I said, I had a good time hanging out all my myself. I meandered down the coastal highway Friday afternoon, and arrived in Morro Bay just in time for dinner. Checked myself into my motel (they gave me room 218, same room number I'd gotten the night before in Monterey), took myself out for a nice meal down by the harbor, came back and read my book in my rented peace and quiet. Saturday I checked out a few places I hadn't been before, like Avila Beach. Didn't know there was a nucular power plant tucked back into the aptly named Diablo Canyon. Lunched in San Luis Obispo, strolled around town a little, pondered what else to see and decided I was really in the mood for a nap, and did not feel at all obligated to do anything. Sunday morning the rock was a bit fogged in, but after I was done drinking my latte in the secluded garden of the Rock Espresso Bar and starting in on Nick Hornby's latest novel "A Long Way Down", it looked clear and bright in the sun, so I drove down there to check it out. 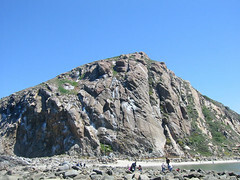 Debbie, did you know that there's a bird sanctuary all around Morro Bay? I've never seen so many pelicans - I loved it! I sat myself on a little rock on the beach and watched them for an hour or so. Meandered (I love that word) back up north, just as leisurely as I'd come down on Friday, and met up with Chris and Kate for a glass of wine and a little taste of heaven where else but at Soif in Santa Cruz. Kate said she'd almost gotten me a rubber ducky as a birthday gift because she really liked the picture of me and Dea Arthur. So let me set the record straight before this gets out of hand: I do not collect rubber ducks. Silvia had bought Dea Arthur for me because she'd seen the rubber ducks on the bathtub at my house and concluded that they were mine, but they're my housemate's. I am not into rubber duckies. Much too plain vanilla for that, so please, nobody get me any more rubber duckies, not even one of these, thank you very much. Having said that, I do love Dea Arthur, and promise to bring her to the next meetup. I think she deserved to be the center of attention, and I will gladly let her have the spotlight again.